Having recently spent time scouring a darker aspect of his music, releasing on Southern Lord, and performing as part of SunnO))), Oren Ambarchi's output of late has taken a turn away from the warmer, more accessible climes of his wonderful "Grapes From The Estate" album. Within the past year or so, the Australian drone maestro has turned his attention to the raw, less sanitised tonal explorations of Stacte Motors and Lost Like A Star, both of which captured Ambarchi at his most vehemently experimental, using elements of mechanical automation to propagate a kind of industrialised drone, divorcing the more uneven, human elements from the compositional process. 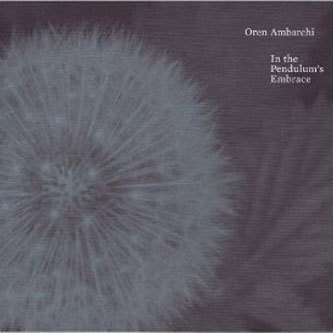 "In The Pendulum's Embrace" finds Ambarchi returning both to the Touch label, and the more emotive, personable sound that characterised his most enduring work. Clearly very much at home experimenting with lower frequency spectra, 'Fever, A Warm Poison' quietly plunges itself into an ocean of bass, the guitar's bottom end resonating beautifully as a corona of cymbal fizz pans across the spatial field. Via small, gradual gestures Ambarchi reaches the piece's midway point only to unleash some more conventional-sounding electric guitar phrases (you can tell this guy's been spending time around the Southern Lord crew, some of this stuff could have appeared on Earth's Hex album), before retreating into a fug of suspended bell resonance and glass harmonica tones. 'Inamorta' raises the stakes higher still, featuring the introduction of a string section - not your usual ensemble format, but rather a multitracked sequence of awkwardly beautiful drone tones, all cast against a shadowy guitar figure, looming in the background. By the time you arrive at the final piece in this gloomy triptych, Ambarchi's moved his music into hitherto unexplored sonorities with untreated, fingerpicked guitar - and even vocals - floating above the expanses of low frequency hum. There's almost a bluesy quality to Ambarchi's sound by this point: it's resolutely downbeat, yet never quite slips into the doom-laden, metallic sound he's recently immersed himself in. Instead, this is a music of meditative introspection, inhabiting dark corners. Very highly recommended.